I have no words to describe how beautiful your work is Ken. Your attention to detail is amazing and the way you think out of the box really sets you apart from the rest. I cant wait to see your next project bud. Well done. Now I am looking forward to Altoona even more. I think a utility pole, vehicle, and like a short (30 footer) rolling stock would enhance an incredible build. I was trying to be cute on the loco. I agree that would detract. Now about the "little people", I say please don't bother, you will spend six months on the nose hairs. Bravo! Absolutely gorgeous work! I love the little pathways and driveways that connect your mini-scenes. You should take a short break and get a clinic put together (seriously). Time to give back to the hobby! Again, well done my friend! Clinic, clinic, clinic. No breaks. This is what you get for being so damn good. Your love shows in you work and your willingness to share. Phil is right on in his comments. Brett you should also be very proud. All of you great and generous modelers take a bow. The placement of so many details in such a small space is a great achievement. None look like they don't belong. This makes little scenes fit and be part of the big scene. And in HO yet. Magnifico (magnificent. Novice, your certainly welcome and thanks so much for the comments and following along. Mitch, posted a few more detail shots and if anyone wants a closer look at anything just let me know. Carl, thanks again and coming from a seasoned veteran in the modeling world I appreciate it. As I mentioned the planning is a good bit of the fun and one I prescribe to heavily. sdrees, thanks much and yes, I cut a bunch of armatures from a select sage bush and another species which I'm not sure what it was. Wes, I always look forward to your comments and input, thanks very much. Not sure yet what my next project will be. I have a packed stable of classic SWSM kits that are begging to get worked on. Wonder if its like Toy Story...when we turn the lights out in our shop, do the SWSM kits all jockey around on the shelf to a position they hope will be the next one you pick! Thanks George. The images were taken with my iPhone 6s and is a vast improvement over my digital camera I used before. Phil, I think you said it very well and described the essence of this forum. Your points, as well as the general camaraderie, is spot on why we're here. I'm honored that you and others might like to see some tutorials. I'll start working on that and have promised a wood tutorial as a pilot of sorts. Thanks Phil. Hey Bill, thanks for wading in here and you know how much I value your opinions and critique. Right, as I mentioned to Phil...I have promised a wood tutorial which is set to be my next project. Thanks again Bill and would enjoy hearing what you've been up to. Ed, thanks very much and you are so right that Brett should be pleased as the creation of O'Neills was genius. His guidance through his manual, pilot model, and personal communications are what sets the stage for our builds. 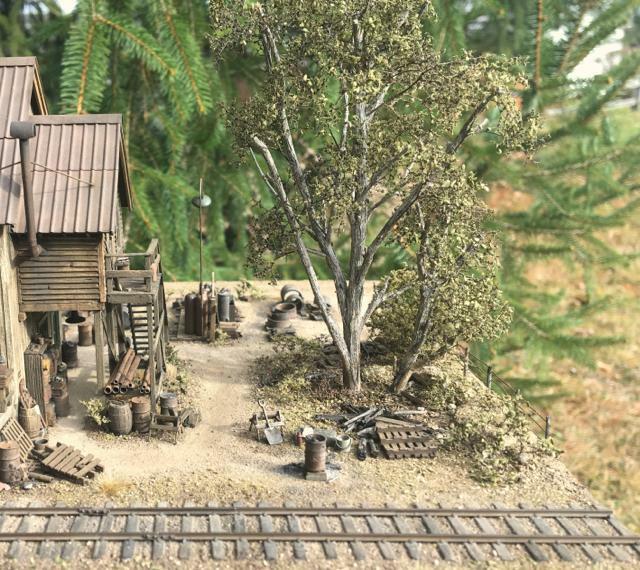 Could I have scratch built O'Neills?...not on your life! Couldn't and wouldn't want to try. The real work here was the research and concept that created O'Neills and the intricacies of bringing a kit to fruition. That my friends is where the value of the SWSM line of products lies. Thanks from all of us Brett for that. Ken, finally I'm back, after many days of computer problems!! Before it locks up again I want to thank you for sharing your wonderful modeling of O"Neills and the tutorials along the way. The photos are so great as is the modeling. Just such a wonderful model and we so appreciate all the effort you took to share. I'm really looking forward to your upcoming tutorials. I completely agree with Phil's comments above and echo them as well. I keep looking at your pictures and don't know whether I should build my kit or just give it to you in despair. When I get the chance to hit the bench I start off at the "put your feet up, grab your coffee and ponder how to go about tackling the project" step as you describe. However, I get stuck at the "lather, rinse, repeat" stage and keep getting coffee and putting my feet up every time I head to the workbench. Always saddling-up is me. Wonderful work Ken. You've really got "the eye." I had not known you were building this. 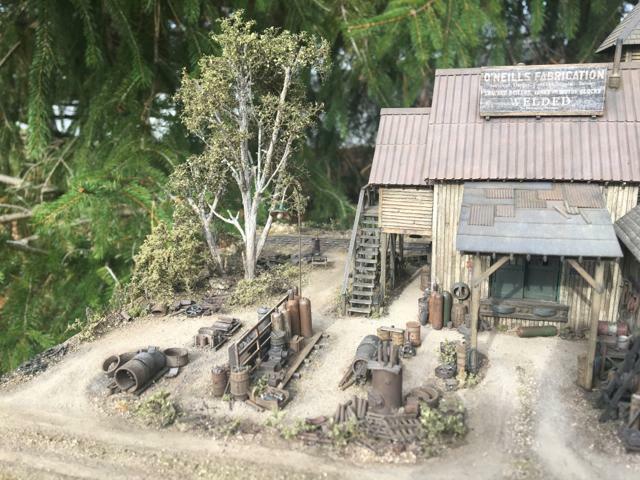 I haven't even started my kit yet, still finishing up on my scratchbuild of the FSM kit Sewall's Foundry (posted on the R.R.Line Forum). But all I can say is WOW! You have done an excellent job on this model, and have enjoyed the last hour looking at everything you've done, and have gleaned a few ideas too :-). I agree with George, I think you have that Greenberg touch. He was also a great inspiration for me, and still is. Tony B! You're back baby! Hey Carl, yes, I am. I dropped in once in a while, but more so to see what Brett's up to. Ken, your welcome. I'd love to share some progress on O'Neills, but I am afraid you have set the bar pretty high, not sure I can reach it, but I will try. Nonsense Tony, your work is top shelf and would be welcome build thread here. I love seeing your take on all the details. Thanks Ken, Awfully nice of you to say. Where in Arizona? I'm in Cottonwood, near Sedona. What kind of "armature". Curious how you used it. We started out near Tucson and then made are way up to Sedona. Spent 3 days in Sedona (neighbors for a few days). I collected some sage brush armatures to make the tree for O'Neills (see photo). Sedona is special. I thought those were sage branches. Have some growing in my front yard. Yours look great. I wonder how the tower would look with a slate roof. I have the O scale kit. Just waiting on time to get it started. Unfortunately wont be any time soon. I am going to do a slate experiment though to see how it looks. I really enjoyed your build. And I learned a lot. Looking forward to you coming to the NG convention in Denver and giving us lessons. And why are you loafing? Where is the next build? More lessons. Quit wasting time sleeping at night. Thanks for a great thread on this build. New SierraWest and to this forum. Just received the HO version of O'Neills Fabrication from Brett. His videos and instruction manual are the best I have seen. Can't wait to start this project and getting pointers/suggestions from others. Getting ready to start this project. Have purchased most Tools/chalks/paints/the chopper/sander...etc as Brett has suggested to move forward. Have built buildings in the pass others from Fos, builders in scale. cambells..etc and Brett by far is the best for his instructions and answering all my questions quickly.